Most people are familiar with more common saws like chainsaws, circular saws, and miter saws, but one of the most overlooked saws these days is the pole saw. In fact, I’d guess there are a lot of people out there who could benefit from using pole saws for certain tasks, but never consider them for whatever reason. Are you one of those who is unfamiliar with pole saws, and the several different advantages they offer? You're in the right place to be. Below, I'll go over all of the ins and outs of pole saws; theirs uses, the different varieties available, and even some helpful pruning tips. As with most saws out there, the name is a pretty good indication as to what it actually is. In this case, it’s definitely self-explanatory. A pole saw is a saw on the end of a pole. How about that? It really is that simple for the most part, but there are of course some important details that help explain things a bit further. I’ll get to the uses here in a moment, but the obvious application for a saw on a pole is going to be for cutting things far out of reach of any standard type of hand saw. With a pole saw, your most basic manual form is going to be a long pole that’s often extendable to around 10-20 feet, and a horizontal hacksaw-like blade on end, usually with a slight curve. As you probably guessed, these types of pole saws are operated by moving the saw blade back and forth across the object by hand, just as you would with any other hand saw -- only this one is on the end of a pole. This is rather primitive but still very effective. Pole saws with more advanced power sources (ie: any that aren’t powered by hand) have a different type of blade; usually, a miniature chainsaw blade that’s adjustable for different angles. This, of course, includes a trigger system that operates the blade’s speed. Regardless of the power source and specifications of a pole saw, the general design and shape remains the same, which makes them one of the most simplistic saws available, and also one of the more versatile ones, often in some surprising ways. Pole saws are a favorite among landscapers and arborists, which I’ll get more into further down in this article. Pole saws are definitely simplistic tools for the most part, but they can be classified in a number of different ways, many of which involve different power sources, blade styles, and how they are even used in the first place. Often the most heavy-duty of pole saws, gas-powered models are usually the most powerful, and the most popular choice of professional landscapers. They are very mobile, typically easy to use, and offer a high amount of cutting power versatile enough for many different scenarios. These pole saws have a gas-powered engine on one end, with a small chainsaw blade on the other. Pole length is dependent on the model, but 6 feet is usually a minimum for most, with some extending even further. Gas-powered pole saw models are similar to gas weed eaters in how they operate. The engine style is basically the same, as is the operation: prime the engine (if needed,) pull the cord to get the engine going, and then use a trigger to supply different levels of power to the blade at the end. These pole saw types offer a lot of mobility, and can operate for long periods of time in between fuel refills, part of the reason many professionals prefer to use them for larger limb clearing and trimming around a property. Electric pole saws come in a few different types, but all of them are powered by electricity instead of gas. Again, like their gas-powered counterparts, they have a similar build to a weedeater, only the engine doesn't rely on combustible fuel. Sizes and reaches of electric pole saws can vary, but you'll find professional level models that extend to around 6-10 feet for the most part. Like other pole saws that aren’t manually powered, the engine portion of the saw is on the bottom, which also connects to a trigger that controls blade speed. Electric pole saws come in corded and cordless models. For most, it’s a matter of preference, as the two don’t vary all that much in size and power. Corded models have a little more power and an infinite power supply, so these are often suitable for those with average-sized yards who only need to cut down a limb or two every now and then. The power cord restricts mobility some, but this is usually not an issue. Cordless pole saws use a rechargeable battery pack like you’d see with a power drill, for instance. These have a limited amount of charge, so you can’t use them for extended periods. You do have the advantage of being fully mobile, but the battery can wear down quick. These are often less powerful than corded models too, but not always. As I’ve already highlighted, pole saws that aren’t manually powered are more or less smaller chainsaws on the end of a pole. If you’re trying to use a pole saw to chainsaw something on the ground in front of you, you’re going to have a hard time with a pole in the way. This is more suited for a conventional standalone chainsaw of course, but there are certain models that are 2-in-1 saws, one being a standalone saw, and a pole saw attachment that allows you to extend it as any other pole saw. These are easily the most versatile pole saws, as you can use them up high, and on the ground for tasks like chopping up a large branch, or whatever else you want to use a chainsaw for. Due to the pole saw attachment, these saws are often not very big or heavy, which does mean a decrease in power and ability to an extent. Still, the versatility and power level is the perfect combination for many buyers. Manual pole saws are the oldest and most reliable pole saws, and often better suited for certain types of sawing and situations. Pole saws are definitely a little primitive in design, but that works to their advantage. The basic pole saw is a long pole with a curved hacksaw blade that has longer teeth -- better for cutting wooden branches. The pole can be extendable to varying lengths, but the cheaper models sometimes have just one long size. To saw, the user simply holds the pole and manually saws a branch by hand. Tedious? For sure, but there are some advantages to this. 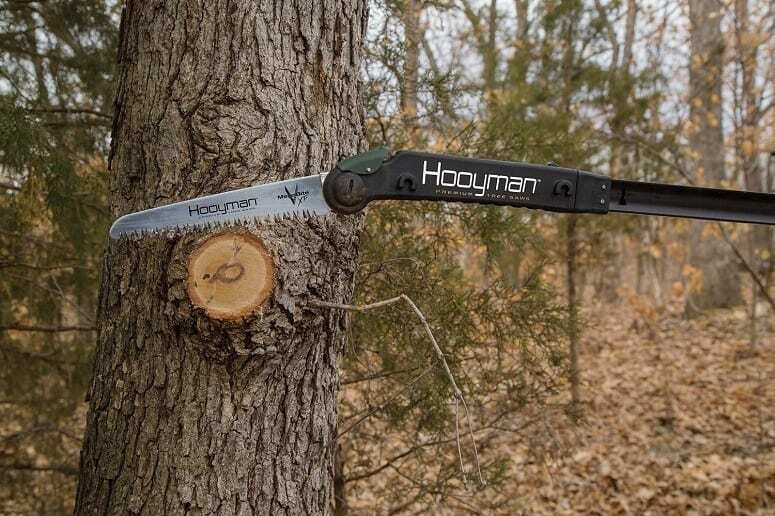 For one, the ability to handsaw a branch gives you a better amount of control as to how it’s cut, which comes in handy when trimming and pruning trees without damaging them. Every professional arborist has a manual pole saw; you can bet on that. Depending on the model, the pole saw might have clippers on end as well, which can be used to make quick cuts on smaller limbs. Hydraulic tools are common for more heavy-duty applications, and the same is true for pole saws. There are several models of pole saws that use hydraulics, and the majority of them are skid steer attachments. These saws, as you’ve probably guessed, can be installed on compatible skid steers and tractors that accompany various attachments. Since these are heavy-duty pole saws, they are used mainly in farming and brush clearing and sometimes clean up after natural disasters. Pole saws are simple tools for the most part, but their overall anatomy and functions vary depending on the type. For the sake of simplicity, I’ll focus on manual versions and engine versions. Although gas, electric, and battery-powered pole saws have some slight differences in how they work, their overall design is essentially the same. On powered pole saws, the saw is typically very lightweight, and almost always extendable. Models that are able to extend do so with a telescopic design. The majority of these versions will be made of aluminum or some other lightweight metal, and usually, have a more reinforced outside layer that’s more resistant to dents and dings. Somewhere towards the middle of the pole is often a rubber grip area to better stabilize the saw when aiming for high limbs and brush. I’ve touched on this some earlier. The saw blade on any powered pole saw is basically a miniature chainsaw setup. That means the blade area is oval, with mini saw teeth that go around in a circle. The teeth on a pole saw blade assembly are a little longer and sharper, with longer points that are more apt for making quick work of limbs, which in turn makes the sawing easier, since you’re holding the chainsaw on the end of a 10+ foot pole after all. The engine is what drives the saw blades on these types of pole saws, and it’s always located on the bottom end and looks a lot like a weed eater or edger. The size and operation of the engine obviously depend on the type of engine itself. Gas-powered engines are going to be the largest size and usually have a primer button, along with a pull cord to get the engine started. Corded electric pole saws usually have the smallest engine size, and battery-powered versions vary depending on the model, and the size of the battery. These can sometimes weigh nearly as much as gas-powered models. You need to have a way to actually operate the blades, right? The trigger is located right one the grip and handle of the pole saw, which is used to provide various amounts of powers to the blade assembly. Manual poles have a few different variations, so we’ll go over all the possible parts that could be included on a more advanced model with all the features. Yes, the pole part again. While powered pole saws usually have a telescoping pole assembly to control the overall reach of manual pole saws are often one size fits all. Many professional arborists tend to prefer fixated pole sizes, as it’s just easier to deal with for whatever reason. The blade on a manual pole saw is very different from powered saws. Rather than a moving blade, a manual pole saw has one elongated hacksaw-type blade with a slight curve in the middle, as this helps with angling onto the branch while standing down below. Many manual pole saws now have clippers that make for quick snipping, rather than sawing. The clippers are similar to hand pruners and clippers for gardens, except maybe a little bigger and mounted on the end of a long pole, of course. This gives the user different options for trimming and pruning, and in many cases, can be a healthier way to trim small branches with a quick snip, rather than sawing back and forth. Pole saws that have clipper on the end will also have a pull cord that is used to cause the clippers to...clip. The cord goes all the way up to the clippers, and then back down to the handle area. The end of the cord usually has a horizontal wood or plastic handle that makes it easier to grip, and thus pull down with. Pole trimmers (and ordinary trimmers) are something you’ll often see alongside pole saws inside any serious landscaper or arborist’s tool collection. While these two types of tools are often used in tandem for most people at some point, they are quite different and have different uses. So what’s a trimmer? These are power tools that are handled similarly to chainsaws, except that you use them to trim bushes and shrubs, especially when trying to meticulously shape them without having to use hand trimmers, which can often take a long time. Trimmers have teeth that move back and forth between stationary teeth, creating a cutting area, not unlike a bigger version of electric razors and hair trimmers. These can range from one to two feet long, and sometimes longer for commercial-sized versions. Well, pole saws are not used for trimming bushes for one. These are only intended for taking on individual branches, both large and small. This can be used for trimming trees to an extent, but not any kind of refined way, only entire sections at once if need be. Also, not all types of trees and shrubs will need trimmers to keep the leaves back or shaped. There are some types of trees that benefit from both, but most people’s property’s will generally have pole saws for trees, and trimmers for shrubs and bushes. What gets some buyers confused at times is the fact that you can buy pole trimmers, which are sometimes sold next to pole saws. In this instance, the concept is the same: something that cuts vegetation on the end of a pole. But that’s where the similarity ends. So, to sum it up, pole saws are for tree branches, and pole trimmers are for bushes, shrubs, and any types of trees that have dense leaves that can be shaped. Now it’s time to really delve into all the common uses for a pole saw, with some examples of each for clarity’s sake. The most common and non-specific use of a pole saw is simply cutting branches. This can be on a tree, a bush, a shrub, or whatever else has branches. For the most part, a pole saw is best used on any branch that you can’t safely reach while standing flat-footed on the ground, and without having to strain. If you have to climb on a step stool or ladder or stand on the tips of your toes to reach a brand to saw, it’s always best to use a pole saw instead. There are a lot of reasons someone may need to cut or trim a branch, which I’ll go over below, as there are different approaches involved. Tree trimming is arguably the more common application of a pole saw. In this case, it’s important to differentiate between trimming and pruning. For the most part, tree trimming refers to the process of removing unwanted limbs. These can be limbs that have died, are in the process of dying, or limbs that are simply in the way of something, like power lines. Many property owners will often trim tree branches to let in more sunlight on the ground and better facilitate grass growth if there is too much foliage in the way creating excess shade throughout the day. Damages from storms can sometimes cause issues throughout the year, whether it’s hot or cold. During warmer months, strong winds and rain can cause branches to break or crack, or even the occasional lightning strike. The same goes for hurricanes and tornadoes. In the winter, branches are more prone to cracking because of the cold. Ice and snow storms can cause branches to crack as well, or even snap off and fall. Whatever the cause, tree trimming is the removal of any limb no longer needed for whatever reason, whether it’s damaged, in the way, or simply unwanted. Unless the tree is short, or the unwanted branches are close to the ground, a pole saw is almost always the best way to go about removing these limbs. Tree pruning and tree trimming can sometimes get mixed up, and that’s certainly understandable. While tree trimming is something that generally happens in response to an issue with the tree and thus happens as needed, tree pruning is something typically done annually, to prepare the tree for healthy growth for the coming warmer months ahead. For this reason, pruning can be a lot more difficult, as it’s entirely strategic, and requires some knowledge about the tree, it’s growth patterns, and any specific methods to keep it healthy throughout the year. Some people also refer to the practice of shaping a tree’s growth as pruning as well, and they aren’t wrong. While this is generally in reference to keeping a tree’s ideal growth shape throughout the year, it’s still technically pruning in a way. A big part of tree pruning is deciding what branches need to be prioritized, and which ones may develop into a problem further down the line, whether that’s from sustaining unhealthy growth on injured limbs, or limbs that could end up getting in the way of others, distorting the ideal shape of the tree. Tree pruning is complicated, difficult, and requires some knowledge on the overall process, as opposed to tree trimming, which is merely lopping off limbs that can’t be on the tree any longer. I’ll go over that in more detail below, including when to prune in the first place. Sometimes pole saws can be used as a sort of wrecking ball for problematic growth, which doesn’t necessarily have to be a tree. Hydraulic pole saws are popular for clearing our large brush and growths in the way of paths, construction, and whatever else is hindered by wayward vegetation and tree branches. For this reason, clearing brush and debris with pole saws don’t require much attention to details, as one simply needs to get rid of whatever is in the way. Pole saws used for this purpose are often the most heavy-duty available and usually mounted to a skid steer or tractor. Those with the skill, knowledge, and experience can use a pole saw to prune a tree most of the time. Again, remember that pruning is not the same as trimming, so if you aren’t sure what you’re doing, it may be best to call a professional at first, especially for very high branches. However, if you feel comfortable with the process, then you’re good to go. With pole saws, manual versions are better for pruning, as powered models tend to make more of a crude cut that’s not ideal for pruning. It can be done, but manual pole saws are gentler on the branch in question. For this section, the pruning being done is in reference to larger branches, cut with the actual saw blade rather than the clippers. A lot of these steps are applicable to trimming branches as well. Start by clearing out the area below where the branch is, and make sure nothing is there that can be damaged by a falling branch -- including yourself. This involves anticipating where the branch is going to fall when it’s cut, so if you’re not the best at doing this, clear out a bigger area just in case. This also makes it easier to clean things up afterward, which may or may not involve cutting the branch down to smaller sizes afterward. Planning the cut involves a lot of different things, and that’s what makes pruning difficult at times. The first part is cutting in the right spot. Most of the time, you’ll want to prune at least a few inches from the trunk of the tree, as this is healthier. If you’re pruning a branch to keep it in line with the rest of the tree’s shape, this won’t be an issue. Consider where the cut line is, and then determine how the branch will fall, and if the cut will achieve the desired effect of the look you’re going for. When possible, always try to cut where the branch is horizontal, as sloping branches can be difficult to deal with. This is an important step that many forget about. The absolute last thing you want is the branch to split while you are cutting it, as it is very unhealthy for the tree, and exposes it to disease and mold. A clean cut is best. If the end of your branch has a lot of weight on it for whatever reason, you run the risk of a split when you get about halfway through the cut. So, if you think there is a risk for this, trim off parts of the branch on the end until the remaining portion seems nice and light. If you want to save your strength a bit, a gas or electric pole saw is better for the weight reduction part, as the cut style doesn’t matter until you get to the main cut. Now that you’ve got everything figured out, it’s time to get out of the way. Whether that means standing as far back as possible from the branch, or off to the side, just make sure you aren’t in the path. Setting a groove in the wood is the best way to ensure a clean cut. So, when you’re in a position to make your main cut, start off by running the saw blade back and forth a few times until you’ve created a groove. Making a groove in the branch creates a sort of guide that will keep the saw blade focused as you saw downwards. If you just go in freehand, you might end up slipping the blade off and damaging the portion that’s supposed to remain, or creating too much of an angled cut. Staying in the groove, saw from the top down, using long, measured saw strokes. The pole should be about chest height, and you should have a firm, controlled grip as you bring it back and forth. If you’re straining or sawing at an awkward angle, you’ll end up with a stump prone to getting infected. The clippers on a pole saw are honestly best for pruning, as they provide a quick, gentle, even cut that’s better for the tree. So when the branch is less than 1.5 inches thick, a timely snip of your clippers is all it takes. If you are worried about the branch being a little too thick, make a groove with the saw blade, and then line your clippers up inside, and go for the snip. This works well most of the time. As for pruning smaller branches and leaf stems, just make sure you’re pruning the right area in an even way, and in a way that promotes healthy, full growth from surrounding branches. A good rule of thumb is to look for any branches that are impeding others. This typically takes place in the middle of the branches, and towards the ends. What Is The Best Time Of Year For Pruning? Determining the best time to prune a tree can be a little tricky. Here are some general guidelines to make it all easier. The wintertime is often the best time to do any major pruning. Although this is made difficult due to not being able to see leaf growth, it’s healthier for the tree, and easier. If you’re pruning in the winter, make sure to wait until the coldest part has passed. Trim down branches that look to be excessively long, or crossing over in front of others. This will result in an explosion of healthy growth when spring comes around. Sometimes it’s best to wait until seeing the tree’s growth before making any pruning decisions, such as any branches you want to slow the growth of, so the tree’s resources are directed elsewhere. Corrective pruning can also be better in the summer as well. If you do choose to do summer pruning, make sure you’re not coming up on fall weather. Have a tree that likes to flower in the spring, and looking for a way to make the blooms even better? If your tree blooms in the springtime, start pruning branches when the flowers begin to fade. This can encourage energy and food in the tree back to the pruned branches, causing new blooms, and furthering their life. If your tree is more prone to blooming in the middle of summer, make sure you take care of the pruning after the last freeze, or very early into spring, depending on your climate. No matter what you do, avoid pruning in the fall. This is when mold and fungi are the most active in the air from other plants, which increases the chances of making their way into fresh cuts on your tree. In case you hadn’t noticed by now, pole saws can be dangerous, and it’s not usually directly from the saw. Falling branches, electricity, and gravity, in general, are all hazards you need to avoid. I cannot stress how important this is. Power lines are not something to mess with at all. One wayward branch fall can catch a line and either bring it down or create a current that leads directly to you. At best, you’ll end up damaging the lines and causing power outages for not just you, but possibly surrounding neighbors as well. And then you’ll be that person that pissed everyone off on the block. Most city’s utility companies are the ones that deal with branches near power lines. If you have branches around a line, call them instead, don’t do it yourself. They are much more trained and equipped to handle this. Another common mistake is the DIYer that gets a little too ambitious with what they want to cut down. If you can’t reach a branch with your pole saw, don’t tell yourself that a step stool or ladder is a solution. Standing off the ground and trying to use a pole saw of any kind if a recipe for disaster on so many levels. Just don’t do it. Call a professional and save the trip to the emergency room. I’ve gone over this some already, but I’ll say it again. Do everything you can to be sure you’re not in the way of any falling branches, and that includes any structures or tools you may have sitting around as well. Get everything out of the way. Pole saws are tools, so they do need proper maintenance to keep them functioning at their best and avoiding problems down the line. I’ll divide these steps into powered and manual types. Much of the maintenance with powered pole saws revolves around the blades and is very similar to basic chainsaw maintenance. Check the oil reservoir to ensure it’s filled with chain oil before using the saw. Check for loose nuts, screws, and bolts, and tighten as needed. Check for any abnormal wear. Adjust tension before using, and undo the tension afterwards, as the chain can contract after cooling. Clean bar rails anytime you sharpen the chain. Wipe the saw down after each use, and then store in a dry place with good ventilation. Engine maintenance depends on the manufacturer. Checking the air and oil filters on a gas engine is always a good idea, however, along with any fuel leaks. If you have an electric model, check the power cord for any cuts or fraying. With cordless models, check the battery for leakage and damage, and make sure the battery contacts are clean and not corroded. With manual pole saws, your only real maintenance will be ensuring the blade is straight, sharp, and without damage. Replacement blades can be found at hardware stores if needed. Checking the pole for any dents or bending is a good idea as well. How Do You Restring A Pole Saw? 1. Take off the damaged rope, while observing how it was looped through the pulley system, as you’ll need to replicate this.You may need to use a screwdriver to encourage the rope to make its way out of the system. 2. Tie the new rope’s end to either the anchor eye, or the grommet at the end of the pruning blades. You may need to use a bowline to keep it secure during the process. 3. Bring the other end of the rope to the next pulley. Bring it from the inside to the outside. If the anchor eye is on the pole, the pulley will be near the blade that actually moves when you pull the cord. 4. Thread the rope from the outside of the next pulley to the inside. 5. Thread the rope through the anchors, and then guide the row down the pole. 6. Trim the rope a little shorter than the pole. Tie on the handle if you have one, and then knot on each end. As you can see, pole saws are easy to use, incredibly handy and versatile, and also come in a variety of types that can best match your needs and preferences for taking care of your trees. Are you in the market for a new pole saw? Be sure to check out our pole saw buying guide, where we go in-depth with our favorite pole saws on the market, which includes some helpful buying advice to help you make the best decision.